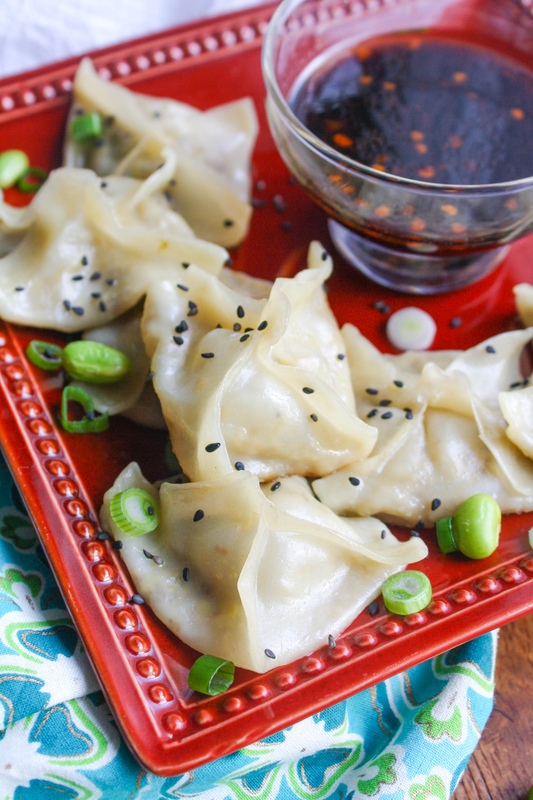 Edamame and Mushroom Potstickers with Dipping Sauce are a great dish to make at home when you need your fix. These little stuffed packets are easy to make, and fun to serve to your family and friends. I always crave potstickers and dumplings. Seriously. At least once a week. Since we don’t live close to any of our favorite Chinese restaurants, I rarely get them. I can get my hands on Trader Joe’s potstickers, but I figured I would try my hand at homemade. I made them once a long time ago, but I that’s about all I remember. That’s always a good indication that it’s time for another go round! 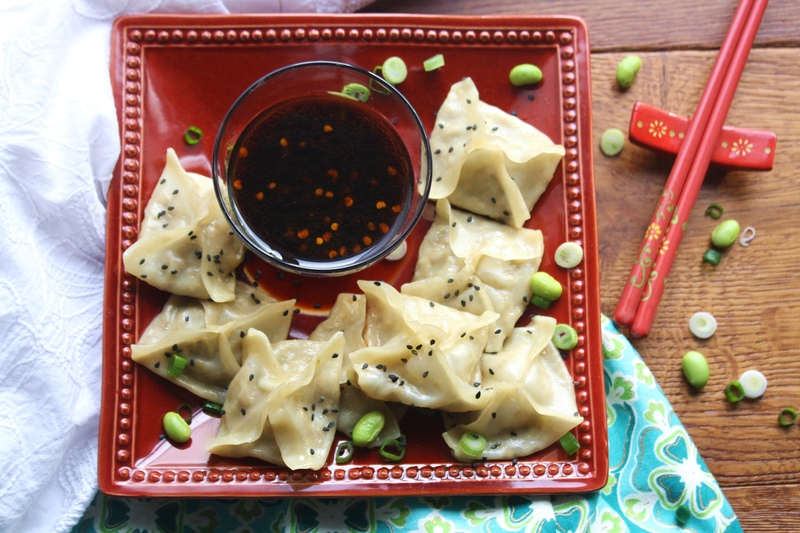 These veggie-filled potstickers with sweet and salty and slightly spicy dipping sauce are amazing! This recipe makes about 20, which probably serves five people. 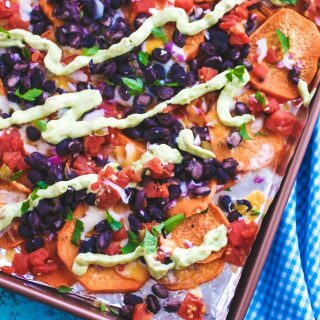 You can easily double this recipe to feed a bigger crowd. Considering the Big Game Day is almost here, you might want to go ahead and do that! I knew I wanted to use veggies in the stuffing for this snack. I had some mushrooms sitting in the fridge and, as always, I had a package of edamame in the freezer. Really, the only thing I needed to put this dish together was the wonton wrappers. After doing a little research on the difference between potstickers and dumplings, I found a cute story. I’m not sure if it’s true or not, but I’ll go with it: way back when in China, a chef had set out to make dumplings. The chef added the packets to his pan to steam, then turned away to do something else. When he returned to his pan, the dumplings had stuck to the pan and crisped up on the bottom. Without time to make a new batch, he inadvertently created a new dish. Potstickers (since they stuck to the pan) were that new dish. Thank you, chef! Try not to overstuff your potstickers. Make sure all the edges of your potstickers are sealed tightly. Wonton wrappers are easily substituted for dumpling wrappers if you can’t find them in the store (although wonton wrappers are square). You can assemble a batch and freeze them to cook later. Assemble the potstickers, place them on a baking sheet so they’re not touching each other, freeze, then carefully transfer to a freezer bag. 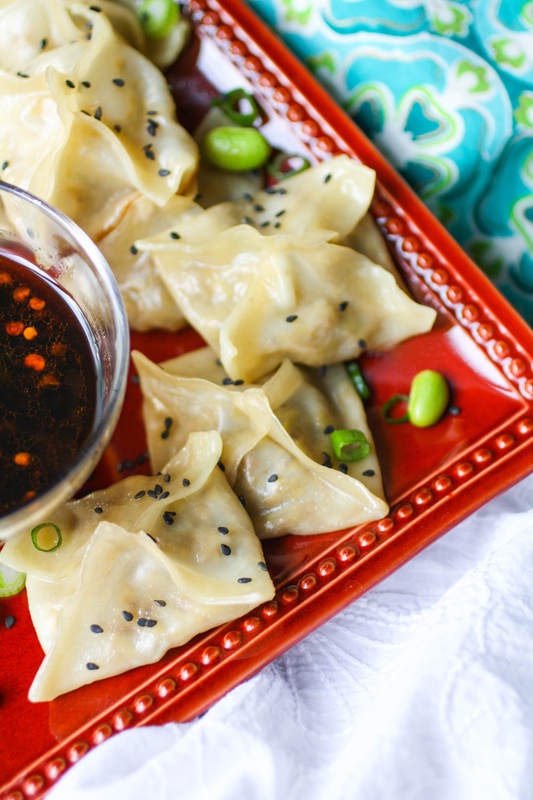 Whether you’re looking for an appetizer for a group of people, a delicious little snack, or a dish to include in a light meal, try Edamame and Mushroom Potstickers with Dipping Sauce. You’ll love these little packets! Combine all the ingredients and mix well. Make sure the brown sugar dissolves. Taste and adjust the seasoning as needed. Set aside, and stir well before using. Add all the ingredients up to the wonton wrappers to a food processor. Pulse until blended but still a little chunky. Taste and adjust the seasonings if needed. Place a small bowl of water on your work surface. Wet a few paper towels slightly and set them aside. Place a large plate on the work surface near you. 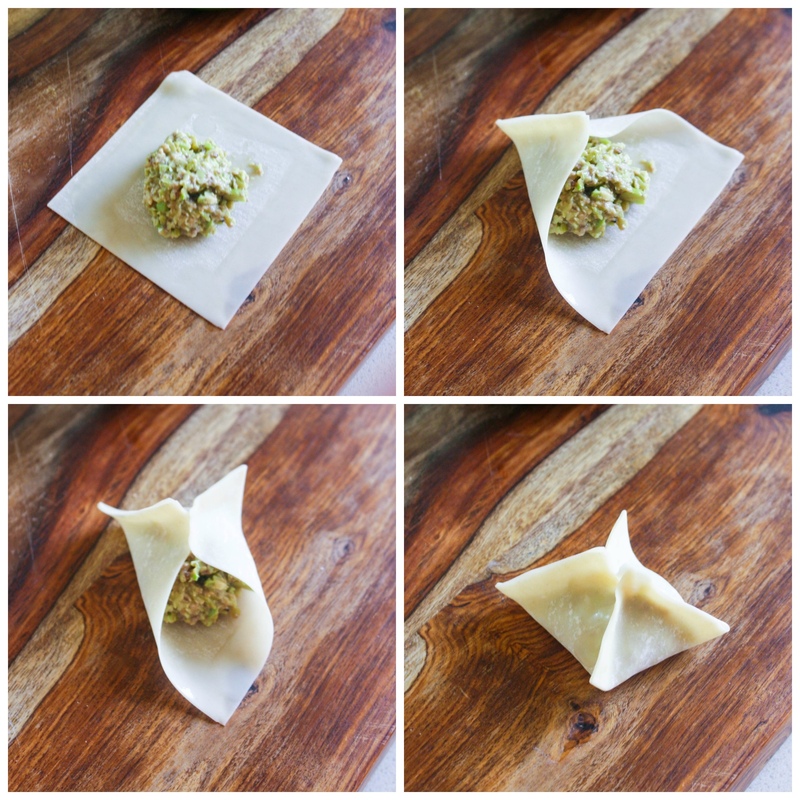 One by one, remove a wonton wrapper from the package and lay it flat on your work surface. 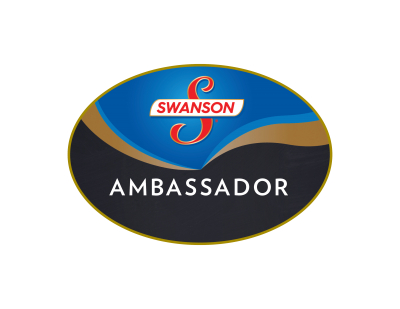 Dip your finger into the bowl of water to wet the outer edges of the wrapper. Place about 1 tablespoon of the edamame mixture in the center of the wrapper. Seal the edges up together toward the center of the wrapper. Press the edges firmly with your fingers to ensure they are sealed. Place on the plate and cover with the wet paper towels so they don’t dry out. When all the filling has been used, add 1 tablespoon of vegetable oil to a large skillet over medium heat. When hot, add half the sealed potstickers to the skillet in a single layer, and cook a few minutes until the bottoms are browned. Add half the water to the pan and cover with a lid. Cook for about 5 minutes, or until almost all the water is absorbed. Remove the lid and cook for another minute or so until the remaining water is gone. Use a clean skillet and repeat the process for the remaining potstickers. Serve warm garnished with the green onion and sesame seeds, with the dipping sauce on the side. These looks so delicious! I love potstickers but haven't had them in a while. Thanks, Marette! I hope you try them! These look so good and your presentation is gorgeous!! Thanks for your kind words, Courtney! 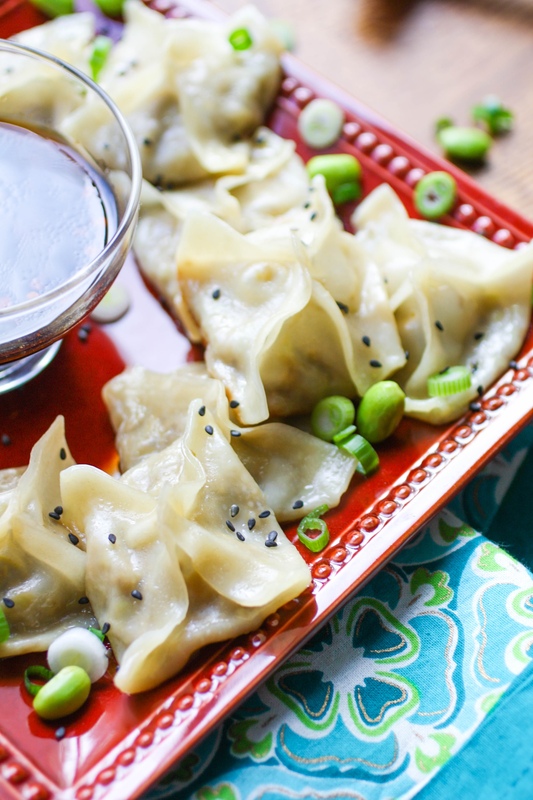 These potstickers look delicious and so healthy too! Beautiful photography as well. Thanks so much, April! Enjoy! Hi Holly! they really are easy to make! Enjoy! I personally love pot stickers, they are delicious and not hard to make. Mushroom is a favorite wo we would enjoy these. Hi Candy! I hope you try these! So fun! Thanks, Holly! I hope you try these and love them! These look so fresh and yummy... and that dipping sauce looks legit! What a fun recipe and totally looks like something we can do!! Looks relish! I love that you added edamame. 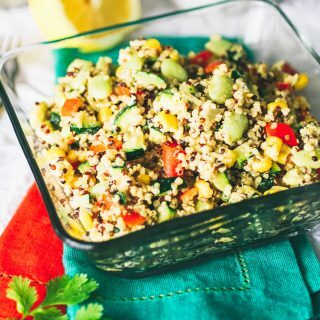 It's one of my favorite plant based source of protein and it's so easy to use in a variety of different dishes. 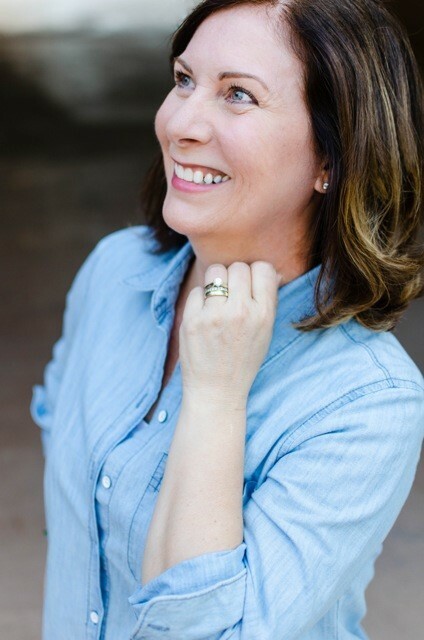 Hi Jill, and thanks so much! I hope you give these a go, and enjoy! I love potstickers! 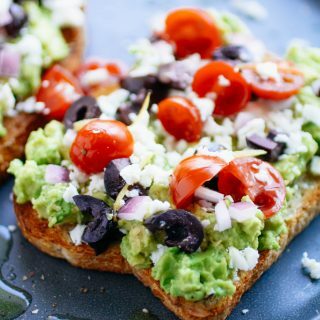 It looks so easy to make at home! Thanks so much, Jessica! They really are! Thanks, Brittany! I love them for gatherings!